Horace Pinker has played in more than 21 countries all over the world from Europe, Brazil, China and Australia. They have played some of the biggest festivals including the Dynamo Open Air in the Netherlands, Popkomm in Germany, Belgium’s Groezrock and the 2007 Vans ZonaPunk Tour in Brazil. They continue to defy the trends and release records with thoughtful lyrics and powerful music that cannot be pinned down to a simple category or genre. Since their formation they have toured North America with Agent Orange, Jawbreaker, All Systems Go and have shared the stage with the likes of Green Day, Bad Religion, Fugazi, Rise Against, Blink 182, The OffSpring, and Jimmy Eat World (just to name a few). They have appeared on over 30 compilations around the world, 12 EP’s (including a split with Face To Face and a EP on Fat Wreck Chords), the top-selling DVD video compilations Cinema Beer Nuts (Hopeless) and Punk Broadcast System (Coldfront) plus numerous TV shows and features in various magazines. They have toured the world relentlessly for the releases of Power Tools (Justice), Burn Tempe To The Ground (Onefoot), critically acclaimed Pop Culture Failure (Jump Up!) and Copper Regret (Coldfront) that featured Chris Bauermeister formerly of Jawbreaker on bass, Red-Eyed Regular (OffTime), Texas One Ten (Thick), the retrospective Carnival Nostalgia: 2000-2006 (Enemy One) and 2011’s Local State Inertia (Arctic Rodeo). Reviews have focused on the bands’ commitment to combine their trademark pop hooks with the buzz of a two-guitar attack, aggressive pop punk sound that eludes categorization by blurring the lines between multiple genres. 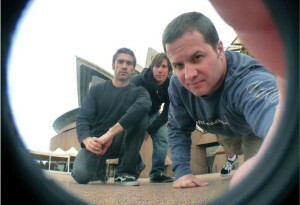 2010 had the band touring China, Singapore, Australia and New Zealand as well as in the studio recording the follow up to 2005’s Texas One Ten. They have released their new record “Local State Inertia” in October 2011 with a tour of Canada in August and a European tour.